Hunt down a ghostly killer in Russafeld. Russafeld — Help Lorne unmask a mysterious killer from her past. 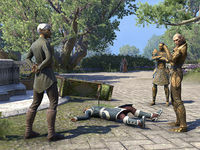 Halimorion, a prominent High Elf, has been murdered in cold blood. Search the fields for clues. Search the victim's villa for clues to the motive. Question Elsoreth at the Bosmer cottage and find out where her son went. Search the nearby shrine with Soravil. Talk to Lorne about what you discovered. Talk to Lorne, and observe the ritual. Hunt down the engineer behind the plot. Deliver the news to Elsoreth. I should talk to High Examiner Lorne. Lorne indicated that I should search for more clues in the grape-fields surrounding the murder scene. I should have a look around. Optional Steps: A few bystanders are lingering nearby. Perhaps I should speak to them. They might be able to provide me with useful information if they witnessed a crime. I discovered the body of a young Wood Elf in the fields, not far from the original murder scene. I should blow the whistle Lorne gave me to summon her and Soravil. The young Wood Elf's dress is spattered with blood, but I found no lacerations on her body. It's possible that she injured her assailant. I should search for more clues. I found a bloody sack. I should see if it contains any vital evidence. I found a bloody sickle in the discarded sack. I should take it back to Lorne and tell her all that I've seen. Lorne asked me to search Halimorion's villa. She suspects that we might find evidence there that could give us insight into the murderer's motive. I found an unsent letter in Halimorion's villa that might implicate the nearby Bosmer in his murder. I should bring this information to Lorne. Evidence of bad-blood between Halimorion and the nearby Wood Elves keep piling up. Lorne wants me to investigate the Wood Elf cottage. I'll meet her partner, Soravil, there. Optional Steps: I could talk to Soravil to get some insight on what exactly we hope to find. It seems like the clan chief's wife might know something. I should speak to her. It sounds like Elsoreth's son might be involved in the murders in one way or another. I should check his room. I found Celan's journal tucked under his bed. It may contain some useful clues. I should examine it. Celan's journal contains a confession that he killed the vintner, Halimorion. It looks like he fled to a nearby shrine to pray for forgiveness. I should tell Soravil about this. Together with Soravil, I need to search the Red Temple for Celan and bring him to justice. Soravil and I split up to cover more ground. I should keep looking for Celan. I found Celan, but the Ghost of the Green shot him with an arrow. He likely won't survive, but perhaps I can get some information from him before he dies. Celan's wound proved fatal. The arrow that killed Celan resembles the one that killed Halimorion. I should take it. It might prove to be a useful clue. I should try to find Soravil before I leave the shrine. I should take the arrow that killed Celan back to Lorne. Perhaps she can use her alchemical prowess to glean something from it. The blood sample was not a match for the bloody weapon found near Farril's body. Lorne believes this new Ghost of the Green killed her, but the trail is growing cold. She believes her friend Tarnamir can help us. I need to follow her to his manor. Someone ransacked the manor before we got here. I should examine the scene. It appears that the Ghost of the Green arrived before us and killed Tarnamir. I should talk to Lorne. Lorne chose to use a forbidden spell to learn the truth of these murders. I should stand back and observe. Lorne used a highly restricted spell to witness the last moments of the Ghost's victims' lives. It seems to be troubling her greatly that she resorted to using it. I should speak with her. Lorne's spell revealed that Soravil engineered all the murders in Russafeld. He wants Lorne to confront him in the Red Temple catacombs. I should accompany her there. I need to find Soravil before he escapes. He must be somewhere in the depths of the Red Temple. I found Soravil in the depths of the Red Temple. There's nowhere left for him to run. It's obvious he won't allow himself to be arrested, so I have no choice but to end this by force. I defeated Soravil. I should return to Lorne to see if she's all right and inform her that Soravil is dealt with. Finishes quest With Soravil defeated, all that remains is to tell Celan's mother what happened to her son. I should go back to town to deliver the bad news. This page was last modified on 19 June 2018, at 04:38.